The Employment Act of 1946 was a major disappointment, after what the policies that John Maynard Keynes had advocated had proven to be spectacularly successful during the latter years of the Great Depression and the World War. It came into law on February 20, 1946 under the Presidency of Harry S. Truman. The Congress was dominated at that time by Republicans in a loose coalition iwth conservative Democrats from the Southern States. … it is the continuing policy and responsibility of the Federal Government to use all practicable means consistent with its needs and obligations and other essential considerations of national policy, with the assistance and cooperation of industry, agriculture, labor, and State and local governments, to coordinate and utilize all its plans, functions, and resources for the purpose of creating and maintaining, in a manner calculated to foster and promote free competitive enterprise and the general welfare, conditions under which there will be afforded useful employment opportunities, including self-employment, for those able, willing, and seeking to work, and to promote maximum employment, production, and purchasing power. The bill was introduced into the US Senate by a Democrat (James E. Murray), who had been a champion of Franklin D. Roosevelt’s New Deal. When the Bill was initially proposed (introduced into the House) it was entitled the “Full Employment Bill of 1945”. Its intent and content reflected the emerging Keynesian view (promoted in the US by Alvin Hansen at Harvard). So it was noted that the federal government has a responsibility to use its fiscal policy to promote job creation. In effect, it aimed to constitute an extension of the New Deal, which had been interrupted by the onset of war. It was clear to most observers that the deficit spending during the War had allowed the US economy to exit the Great Depression with full employment. This view was embodied in the research reports published by the National Resources Planning Board (NRPB), which was set up by the Executive Reorganization Act of 1939 to ensure national policies were coordinated. That institution was axed by the conservatives in 1943. The problem was that while the liberals wanted to enshrine the right to work into US law, there was little public support, if only because the immediate Post-War period remained buoyant and the euphoria of victory abstracted from more prosaic matters like where were the jobs going to come from. Stephen Kemp Bailey’s analysis Congress Makes a Law: The Story behind the Employment Act of 1946, originally published in 1950 but reprinted in 1980, provides an in-depth analysis of the political maneuvering associated with this piece of legislation. He follows the conflict between the so-called “Continuations Group”, which was a coalition of progressive and trade union organisations who clearly wanted a full-blown Keynesian commitment to the right to work, and the conservative lobby, which included the Committee on Economic Development, the Machinery and Allied Products Institute (representing the manufacturing bosses), the US Chamber of Commerce. The bill entered Congress through the liberal Senate and received sympathetic committee support. However, once it went to the House of Representatives, which was dominated by conservatives at the time it became an object of vilification. While many thought the dispute was about urban-rural discord exacerbated by North-South type dissonance, the real conflict was about the dispute about the size of the federal government and its role in the economy. While the liberal Democrats had argued for the legislation to enshrine the principle of ‘full employment’ and the right to work, the fierce opposition from the conservatives and their industry funders succeeded in watering down the final Bill. The original intent of the Bill was to expand the Federal government’s ambit in the economy. It declared that all those willing and able to work had a right to a job and that the federal government was responsible for fulfilling that right. So underpinning that philosophical intent was a vision for increased use of fiscal deficits through a variety of spending and taxation measures necessary to maintain sufficient jobs. … having always more vacant jobs than unemployed men. The conservatives invoked the economists from the business lobby, who were not enamoured to Keynesian economics, to redraft key sections of the Bill. If you trace back through the debate at the time you will see that the usual suspects were wheeled out by the business lobby in their opposition to the Bill. They hated the thought of the use of federal deficits being normalised. They claimed the creation of full employment would lead to accelerating inflation – thus implicitly acknowledging that the business lobby wanted a permanent pool of unemployed workers (beyond frictional movements between jobs) as a disciplinary force against wages growth. … advanced a much smaller, though highly significant, role for government – the manipulation of tax policy and the use of government spending to raise purchasing power and supplement private investment until the economy reached full employment. Its goal was competitive capitalism freed from both excessive government control and the ravages of the business cycle (p.9). The House Committee on Expenditures in the Executive Departments, led by a rabidly conservative Democrat from Alabama (Carter Manasco) killed off the liberal elements in the Bill. The Bill saw the ‘free competitive enterprise’ as being the vehicle for jobs growth and the satisfaction of the aim to achieve ‘maximum employment’. Completely absent in the legislation was any notion of a right to work, which the original draft of the Bill had deemed essential. The Federal Reserve Bank History archive – Employment Act of 1946 – provides an interesting analysis of the Bill. … the removal of the claim that citizens have a “right” to a job; so, too, is the acknowledgment of the importance of maintaining purchasing power — that is, the need to keep inflation in check. So, already, the concept of maximum employment was replacing full employment and conservative politicians were expressing the view that unemployment would be used to keep inflation in check. … exclude the last remnants of … dangerous federal commitments and assurances (including the wording of the title), but would provide for an economic planning mechanism of some sort in the Executive and legislative branches, and for a moderate program of public works. They also had the belief that the US government could manage a moderate program without continuous deficits. The following graph shows the federal fiscal balance as a per cent of GDP from 1930 to 2016. The light grey bars are the NBER recessions (peak to trough). 1. The fiscal balance is nearly always in deficit over the period. 2. 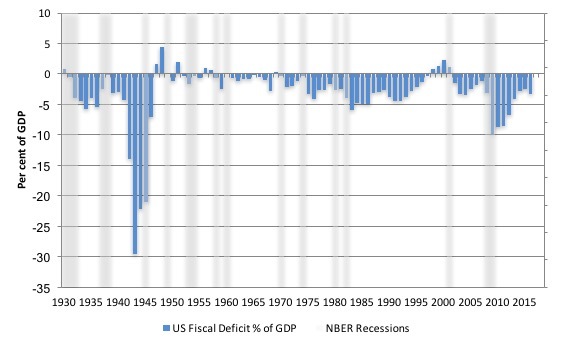 When it has been pushed into surplus by conservative thinking, a recession has followed almost immediately and resulted in larger deficits than before – as a result of the interplay between discretionary stimulus packages and the automatic stabilisers. Those deficits essentially provided the economic milieu for the US labour market to be fairly strong up until the early 1970s. As the US entered the peak of its Vietnam War commitment inflation started to accelerate and unemployment started to rise. In 1972, a Democrat Senator Rupert Vance Hartke tried to revive the push for a true full employment commitment from the US federal government. I was particularly attracted to Rupert Vance Hartke because he fell out with Lyndon Baines Johnson over Vietnam. Indeed, Hartke was the first US Congress member to “declare his opposition to the Vietnam War” in early 1965 (Source). We learn that his opposition to the War was “deeply unpopular in his homestate of Indiana”. While he declared the War to be “utterly immoral”, LBJ dismissed the views as being from a “two-bit mayor from a two-bit town” (Hartke was previously the mayor of Evansville). Anyway, on February 16, 1972, he introduced bill S.3179, the – Full Employment Act of 1972 – to Senate of the 92nd Congress. You can also read the text of the Act and the introductory remarks by Rupert Hartke to the Senate in Congressional Record – Senate, Wednesday, February 16, 1972 (large file!). The proposal was to have “Guaranteed jobs – not guaranteed welfare”, which is a dichotomy that still resonates today as more and more progressives (and conservatives!) advocate basic income and essentially concede that the neo-liberals have won – they refuse to allow the state to use its capacity to eliminate entrenched unemployment. To provide opportunities for employment to unemployed and underemployed persons, to assist States and local comunities in providing needed public services, and for other purposes. (6) economic prosperity and stability in the United States and the well-being and happiness of US citizens will be enhanced by the establishment of a comprehensive full employment program designed to assure every American an opportunity for gainful employment. I included the full statement of purposes to give you a flavour of the wording used in contrast with the watered down 1946 Employment Act. In fact, the proposed 1972 Act was very similar in wording to the initial Act in 1946 that finally became the Employment Act after it was ‘Manascolated’. In introducing the Act to the Senate on that Wednesday in February 1972, Rupert Vance Hartke made some interesting observations. 1. The Employment Act of 1946 had failed after more than 25 years in operation to “achieve that all-important objective of full employment”. 2. Full employment was a benchmark and only once it is achieved can “effective welfare reform” be considered. In other words, when there is mass unemployment, government should no go about hacking into the income support system. 3. The full employment narrative had been “For too long … the subject of rhetoric and empty promises”. … provide a job for every able-bodied American … anyone who cannot find a job in the private sector will have access to a public sector job. These will not be transitional jobs, nor will they be made work jobs. Instead they will be jobs which will help translate the social concerns of Government into concrete action. They will be jobs in which workers can take pride in their accomplishments. Which sounds very much like the vision that Modern Monetary Theory (MMT) proponents have for the Job Guarantee policy that lies at the heart of our macroeconomic stability framework. 5. Indiscriminate use of fiscal stimulus does not necessarily create full employment. There was considerable disparity in unemployment rates by gender, and ethnicity. Consequently, “the full employment I propose today would provide for a complete end to actual unemployment for all groups of Americans”. … match public sector jobs to the skills and aptitudes of the existing supply of labour … Experience has made it clear that the private sector cannot expand to provide jobs for these millions of able-bodied unemployed without at the same time causing inflation. The answer lies in creating new public sector jobs – jobs financed by the Federal Government and provided at the Federal, State, and local levels. Again, very close to the way we think the Job Guarantee would be made operational. 6. While some “may oppose any legislation which turns over to the public sector a larger portion of the Nation’s economic activity … I say that Government is in a unique position to calculate both the social costs and social benefits of its activities”. Government need not be solely concerned with maximizing profits and replacing manpower with technology. Instead, Government can weigh the availability of unused manpower against the values of purer air and water, better schools and medical care, more livable cities, safer streets, better care of the aged, better mass transit, more day care centers and other services which can best be offered by Government. In short, Government can match the concerns of society to the resources at hand. 1. The way we should always appraise government resource usage in contradistinction to neo-liberal bean counters who can only see $ signs. 2. The concept of public purpose, which lies at the heart of Modern Monetary Theory (MMT) policy motivation. 3. The areas in which productive jobs can be created under Job Guarantee schemes, which deliver beneficial outcomes for society. Finally, Hartke invoked a sort of ‘robots are coming to take your jobs’ argument. The continued growth of a technology intensive society promises leave millions of Americans with obsolete skills and no prospects of meaningful employment. This situation seems so needless and wasteful when there are so many unmet public needs crying for manpower. While we can debate the veracity of the technology kills jobs belief, Hartke’s vision realised that there was always a choice even in the face of robots heading towards workplaces. The public sector can always choose how fast they will introduce new technologies. And there will always be millions of jobs in areas where there are unmet public needs. It is always going to be a choice how far ‘robots’ go in killing work. A cohesive society will make different choices to one that has become fragmented and divided by neo-liberal dogma. The Bill was read twice and then referred to the Committee on Labor and Public Welfare, and, as far as I can tell, was buried at that stage of the legislative process. President Nixon and the conservatives in Congress were never going to entertain its passing. In 1978, the 95th US Congress passed the – Full Employment and Balanced Growth Act (the so-called Humphrey-Hawkins Act reflecting the sponsor, Democrat Augustus Hawkings and Senator Hubert Humphrey). But that is another story … for another day. The right-to-work agenda keeps coming back because people care about having work. The opportunity to work is central to a healthy society whether it be capitalist in nature or something more progressive and inclusive. In a capitalist society, where private firms make decisions on the basis of profits rather than the needs of the people, there is more reason for governments to intervene and guarantee work. Under these circumstances there will be larger pools of idle labour (unwanted by the private profit-generating machine) and larger unmet social or community need, where there is limited capacity to generate private profits. 4. The conservative opposition to full employment legislation in the US. I am helping out as a policy advisor for a mayoral campaign in Minneapolis and the candidate has been receptive to running on a JG. I know as a city much of the fiscal space MMT allows for isn’t available though so I would like to get some idea of how the costs of the JG might go as well as the savings on other welfare programs. He also is interested in starting a municipal bank which might add some degrees of freedom. Do you know of any relevant research and/or proposals for something similar so I can get some idea of the numbers behind this plan? Pretty much answered the question Chris Herbert had in your previous blog post. There is just so much freedom with knowing MMT. I constantly get these articles about how robots are going to take over so no more jobs, and we will all be living in squalor. Makes no sense. Somehow life will be harder with more sophisticated tech?! Hahaha… I don’t think anyone can claim inventing fire as a negative because it forces some shaman out of a herb medicine role and then somehow the tribe decides to abandon the shaman. Of course, reality is that we are living in the neo-liberal age with “bean counters who can only see $ signs.” All sort of ridiculous outcomes manifest. Jim Green: I suspect that the problem with social insurance paid from workers pay is that the money comes out of the real economy and cuts the amount of money people have to spend whereas if the government created the money then it would be added to the real economy. Isn’t that correct? This is a great post, thank you. It really highlights the difference between the left of the past and the left of today. You don’t really hear too much about public sector-driven full employment policies anymore and I think that is a result of the left being an “hourglass” coalition of affluent social liberals and the poor (who are often immigrants and ethnic minorities), young people and students. It encourages a kind of charity-like approach to politics hence the obsession with basic income. When the left-wing’s base was in the trade unions the left was much more concerned with full employment. Bill has written about this on this blog in great detail, for example http://bilbo.economicoutlook.net/blog/?p=21944 and he had a great series about the transition in Britain last year, eg http://bilbo.economicoutlook.net/blog/?p=33907. My take always include: the APEC oil crisis put Keynesianism up against a real constraint in an important economic input, unions started an unsubtle wage/price war (threatening essential services too strongly), the MSM + academic economist propaganda storm hit, Labour governments in both countries started talking surpluses, in Australia there was a right wing coup, then Thatcher the great bover boy of the masters. In Australia, the Fraser government sort of continued with a watered down form of the old order, but sank themselves by talking surpluses, delivering deficits and generally being as divisive as a right gov could be in Hobbiton down under. Then Hawke took advantage of the general desire for rapprochement to deliver a significant neoliberal deform with tacit union support. They did everything the purists in academia told them would make us all rich, but instead put us on a slow train to bankruptcy. Now Australia is pretty hard to recognise. Unions are reviled for being too strong and too weak. Public servants are deprecated for being non-entrepreneurial and sidelined for being to expert. Everyone wants the light and thinks cutting the power lines will get them there. The idea has crossed my mind that the light dawned among the higher orders that making money purely through Finance is vastly more reliable than trying to make it through manufacturing or resource extraction. And Finance needs very few people. So the monster industries that John K. Galbraith identified as the Planning Sector evolved into the Finance/Insurance/Real-Estate sector by shedding all the things that were difficult to plan. It might have been the Club of Rome Report around 1972 that pointed out how deficient physical industry was going to be.